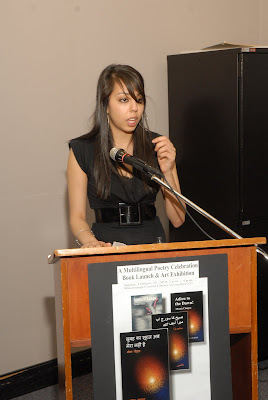 "Glimpses of the Setting Sun - A multilingual poetry celebration, BOOK LAUNCH & ART EXHIBITION". 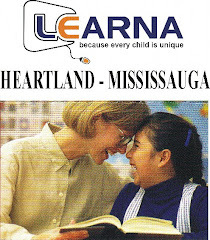 Sunday, February 28, 2010, 2 p.m. – 4 p.m. Mississauga Central Library, Mississauga, Ontario, Canada. 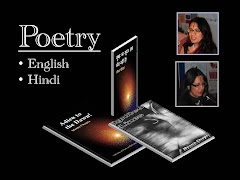 A special afternoon of poetry reading with a BOOK LAUNCH featuring ‘subah kaa suuraj ab mera nahii.n hai (Adieu to the Dawn)’ in Hindi & with readings both in Hindi and English was held on 28th February 2010. Coming to Canada from her native India, artist and poet Meena Chopra’s intense search has taken her far beyond boundaries in finding her new identity. 2nd edition of her previously published a book of English poems "Ignited Lines" was also released. Readings were in both Hindi and English, and included a work transliterated into Urdu script by poet Nasim Syed, and transliterated into Roman script by poet Suman Ghai. Meena Chopra has held several exhibitions nationally and internationally. She represented India internationally on many occasions including at the South Asian Association for Regional Cooperation artists meet in 2002. 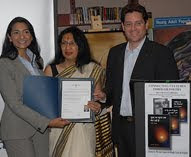 Event was hosted by Mississauga Library System of CANADA. 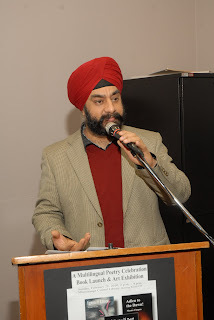 Mississauga-Brampton South MP Navdeep Bains acknowledged how anxious everyone, himself included, was to watch Canada take on the United States, but noted that the presence of so many writers, artists and well-wishers from the Hindi community and beyond was a sign of support for the cross-cultural connections Chopra advocates. 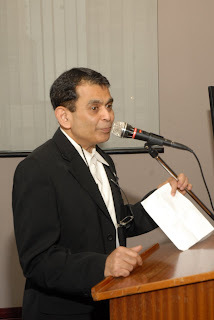 “I consider Meena not only a poet and an artist, but a bridge-builder,” said Bains of Chopra. “She does not recognize any borders – her experiences are universal,” said Suman K. Ghai, a friend and co-founder of the Hindi Writers Guild. 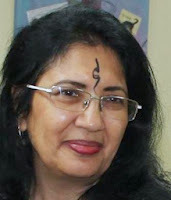 Ghai transliterated Chopra’s poems into Roman Script for her second collection, subah kaa suuraj ab mera nahii.n hai (Adieu to the Dawn), which was released on Sunday. Dr Saldahna, a well known philanthropist and patron of art released the Urdu edition of the book. Speaking about her poetry, Urdu poetess Nasim Syed who tranliterated Meena's poems in to Urdu, said,"She is painting when she writes and she writes when she paints with very powerful imagery". Marian Kutarna, Manager History & Art department of the Mississauga Library System and organizer of this program stated, "this was the first multilingual book launch at a Mississauga library". She further said, "the sound of the language is the poetry, the human heart is the same heart in all of us and that is what we share here today". Binoy Thomas, editor Weekly Voice was "Master of Ceremonies" and ably compered the afternoon with his unique wit & humour. Art Exhibition has been shifted to Meadowvale Library Mississauga and will remain there for view till 30th April.There will be an open discussion on Meena’s poetry on 11th April 2pm to 4pm in Meadowvale Library organized by the Library and Hindi Writers Guild. All are welcome. RSVPmeenachopra17@gmail.com. bahut bhut mangalkamnayen hai.srijan ki disha me aap bahut aage nikal chuki hai ,shikar par pahuche. Hi please read some of my poetry ! This tweet about famous poetry is really beautiful. I adore poems. Another poetry blog i check out a lot is named myownverse .